The animal source for the powder horn has not been identified, but both bison and cow horns were used. 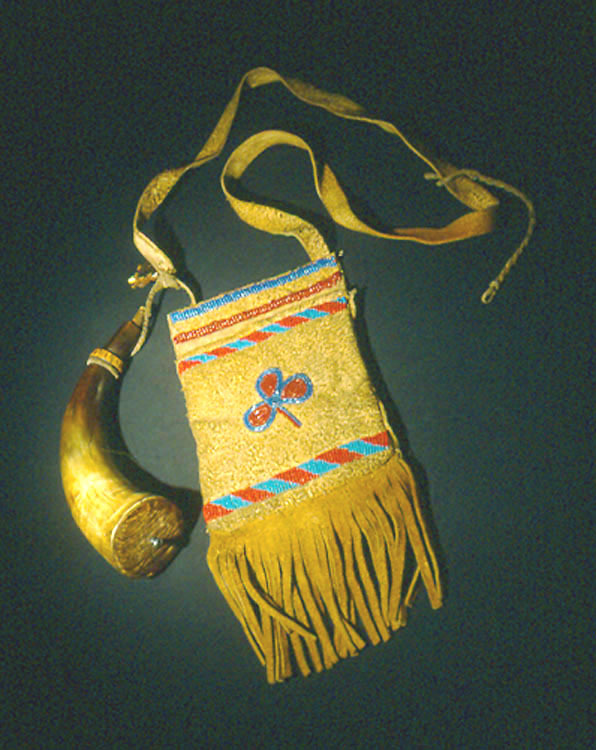 The larger end of the powder horn is fitted with a wooden top and the narrow end with a stopper. The hide shoulder strap is missing. Learn more about the Cree - enter 'Cree' in the search box to your left. Can you spot the horn in the HBC calendar painting Fort Prince of Wales? Check the Beaver Index - e.g., type in Cree, clothing, crafts, hunting, etc. These were typical firearm accessories used by both Aboriginal and European traders and by settlers. A hide bag contained shot, gun flints, gun worms (a cork screw-shaped device used to remove unused wadding and ammunition from the barrels of muskets), files, and other equipment required for gun repair. A small metal container for measuring the correct amount of gunpowder to be poured down the barrel of a musket might also be carried in the bag. The strong and waterproof powder horns were used to hold gunpowder. Some owners decorated their powder horns with engravings.